There are lots of discussions on this subject, though there is little information about it and there are reasons for this matter. 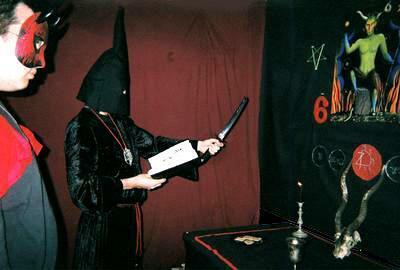 Satanism is many times confused with Paganism. 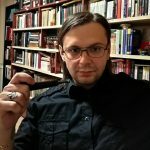 As I pointed out many times in my essays and articles, people have a tendency to believe that Satan, the Devil, the God of SATAN-ism, is actually a god of a Pagan pantheon. This is because it happens that Satan and that god have many similarities. There’s Ahriman, there’s Tiamat, Prometheus, Seth, Typhon, Kingu and all the way to Malek Taus and Mara. But there is no real proof for it. I also stated (and I will say it again) that I do not deny the fact that Satan WAS indeed worshiped in other pagan religions under different names, as a representation of either evil or adversary/opposer. It’s just that we cannot be sure which god was indeed Satan. I am very skeptical. I do not believe without any real proof. HOWEVER… there is proof that the Demons are actually Pagan Gods, many of them at least. Eurynomous/Eurynome/Euronymous for example was essentially a Greek god of Death, but was later changed by the church into a Demon. HOWEVER… there is proof that the traditions and celebrations of Satanism and Witchcraft (especially traditional Witchcraft, not medieval Witchcraft) are in most part, Pagan traditions and celebrations. If one is to delve into a bit of study of Satanic religious practice and the Pagan religious practice, he will clearly notice the many similarities between them. There are practices and beliefs of the Pagan religions that are also part of Demonolatry and also Satanism. The reason why I started to talk about this first is clear. I want everyone to understand that, even though many holidays listed here are PAGAN and have PAGAN ROOTS, they are and possibly have been practiced by Satanists over time. Now, without further ado, allow me to properly begin this subject with an explanation of the so called Satanic Holidays. In “The Book of The Circle”, K.Whalen tells us of a thing called the Wheel of Change. This Wheel of Change also known as the Wheel of the Year is essentially a Wiccan and Neopagan term for the annual cycle of the Earth’s seasons. It consists of eight festivals (referred to by Wiccans as Sabbats. The word Sabbat comes from the Greek word “sabbatu” meaning “to rest”) all emerging from Celtic and Germanic pre-Christian feasts. Though Whalen’s “Satanic” Wheel of Change consists of few different festivals, they all represent the natural changes of the seasons. In Satanism, Demonolatry, Witchcraft, Paganism and Wicca, nature is very respected and plays an important role in these religions. 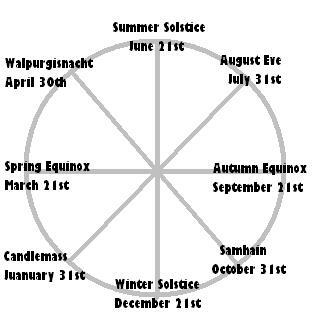 The Solstices, Equinoxes… the seasons… represent in a symbolic way, the balance of life, death and birth (life = summer, death = winter/autumn, (re)birth = spring) in pre-christian traditions, in pagan feasts or “sabbats”. Celebrating these changes of the seasons, the practitioner enters in the rhythm of each season and prays to the gods for various reasons (for example, in Summer he prays for fertile soil). The rituals are most of the times accompanied by feasts (in summer for example fruits are being served, especially apples to symbolize the forbidden fruit. In winter it is served meat, after the sacrifices) and also parties (for example, in Demonolatry on the 21st March at the Spring Equinox there is a ritual dedicated to Lucifer in which marriages are also being held). In Demonolatry the seasonal changes are represented by the elemental Demons. The seasons of the year – Spring, Summer, Autumn and Winter are the result of the Earth’s tilted axis (tilted from perpendicular to the plane of the ecliptic by 23.35°) and annual rotation around the Sun, causing different areas of the Earth’s surface to face the Sun at different times of the year. The solstices are days when the Sun reaches its farthest northern and southern declinations. The Winter Solstice is the shortest day of the year, December 21, marking the beginning of Winter. The Summer Solstice is the longest day of the year and occurs on June 21, marking the beginning of Summer. Equinoxes are holidays in which day & night are of equal duration. The two yearly equinoxes occur when the Sun crosses the celestial equator. The Spring equinox occurs on March 21, and marks the beginning of the Season of Spring; the Autumn Equinox occurs on September 21, which is the beginning of Fall. Four of the eight festivals fall on the solstices and equinoxes and are known as “quarter days” or “Lesser Sabbats”. The other four fall approximately midway between these and are commonly known as “cross-quarter days”,”fire festivals”, or “Greater Sabbats”. Samhain (also known as: Halloween/Hallowe’en, All Hallows Eve, Shadowfest, Festival of Fire, Last Harvest, Ancestor Night, Feast of the Dead and Noson Calan Gaeaf) is a pagan festival representing the final harvest, marking the beginning of winter and Death. It starts on 31 October and ends on 2 November. The origins of Samhain come from the Celtic festival of the end of the harvest season. It is sometimes regarded as the Celtic New year for reason that the contemporary calendars produced by the Celtic League begin and end at Samhain. Samhain is a celebration of Death. According to pagan tradition, Samhain is a time when the boundaries between the world of the living and the world of the dead become thinner, allowing spirits and other spiritual entities to pass between the worlds to socialize with humans. It is a time when ancestors and other departed souls are especially honored. In this time people pray for the souls of the deceased, make offerings to the spirits such as meals (favorite foods of the family’s and community’s beloved dead. It is still the custom in some areas to set a place for the dead at the Samhain feast, and to tell tales of the ancestors on that night) and leave a place set for them at the table, and traditional songs, poetry and dances are performed to entertain the Dead. In some traditions, people use to leave a door or window opened to the west to invite the beloved dead ones to attend to the celebrations. Many leave candles or other light burning in a western window to guide the dead home. In Demonolatry (Samhain is celebrated in Demonolatry and falls also on 31 October) people pray to the death Demons (Eurynomous, Baalberith, Babeal) to honor them or to ask them to protect the souls of the deceased, make death rites and sometimes practice curses to expel the negative energies. In traditional Satanism sacrifices of animals are made in the honor of the death Demons and Satan. Divination is a common folkloric practice that has also survived in rural areas. Practices as determining the identity of one’s future spouse, the location of one’s future home, and how many children a person might have are still practiced to this day on Samhain. As I said, it also marks the beginning of winter. This symbolizes the death of nature and the death of the Earth. It is a celebration of Death. It is a time when celebration conquers the mood of death. At the celebrations great bonfires were lit to attract the spirits of the dead who would be seeking warmth. Celtic Reconstructionist Pagans tend to celebrate Samhain on the date of first frost, or when the last of the harvest is in and the ground is dry enough to have a bonfire. Villagers were said to have cast the bones of the slaughtered cattle upon the flames. In the pre-Christian Gaelic world, cattle were the primary unit of currency and the center of agricultural and pastoral life. Samhain was the traditional time for slaughter, for preparing stores of meat and grain to last through the coming winter. The word ‘bonfire’, or ‘bonefire’ is a direct translation of the Gaelic tine cnámh. With the bonfire ablaze, the villagers extinguished all other fires. Each family then solemnly lit its hearth from the common flame, thus bonding the families of the village together. Often two bonfires would be built side by side, and the people would walk between the fires as a ritual of purification. Sometimes the cattle and other livestock would be driven between the fires, as well. Sacrifices of animals are not only part of Satanism’s Samhain tradition. Celtic pagans used to take stock of supplies and slaughter livestock for winter stores in order for the people and livestock to survive the winter. This custom is still observed by many who farm and raise livestock. To me Samhain used to be a very important Holiday. Not because I could pray for my dead relatives, but because I respect Death very much. I believe that Death is too important to just leave it out and fear it. I believe we should celebrate it and try to understand it. I first started celebrating Samhain back in 2004. It was a celebration that I wanted to remain in my family tradition. Every year I raised an altar to celebrate Samhain. 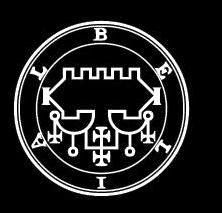 Depending on the circumstances, I might’ve put on the altar the picture of a dead person that I would like to pay my respects to and to communicate with or simply pray for, or I might’ve put (as presented in the picture below) a picture with the sigil of one of the death Demons. I also used my fake skulls and lit black candles to represent death. Some people have asked me how they could celebrate Samhain in a Satanic way. 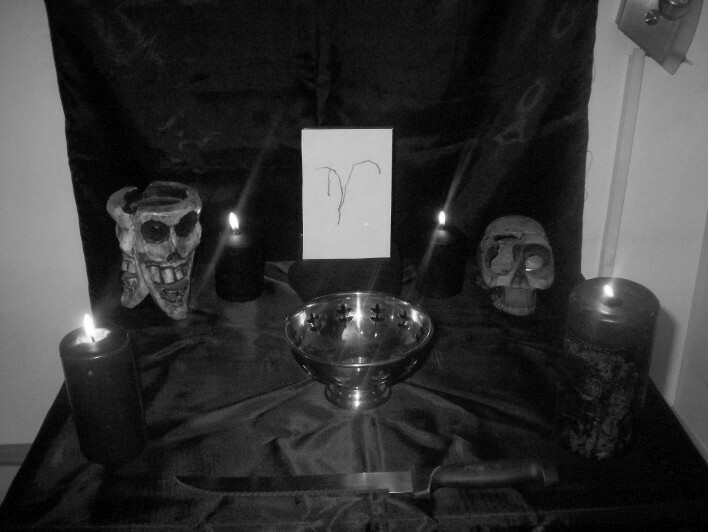 You can find a ritual at the article Satanic Samhain Celebration. Yule (also known as Yuletide, Yulefest, Yules, Jul, Juletid, Julfest, Jül, Jól, Joul, Joulu, Jõulud, Joelfeest, Géol, Feailley Geul, Midwinter) is a pagan festival that is held on 21 December. Yule or Midwinter is the longest night of the year, marking the peak of the winter season. The festival is said to have been influenced or even originated from the Roman winter festival Saturnalia held on 17 December. However, it is certain that Yule was essentially a religious festival for the Germanic people, until recently when it was absorbed into and equated with the Christian festival of Christmas. The festival was then placed on December 25 when the Christian (Julian) calendar was adopted. Nevertheless, its basic structure remained almost the same, the people who were conquered and spiritually condemned still refused to put away these traditions. The Winter Festival is also celebrated in Demonolatry and falls on 22 December, when a ritual to Belial is being held. 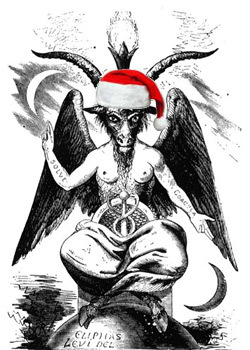 In Satanism, it is common that purification rituals are to be done on Yule. 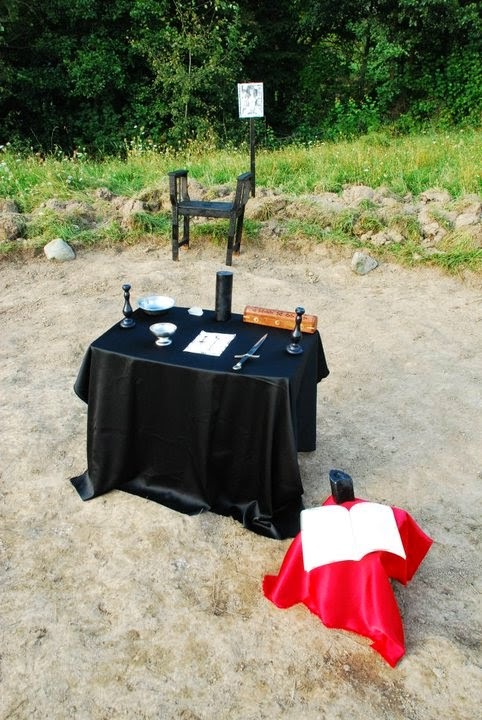 It is also ideal to re-consecrate the ritual chamber and ritual tools for the upcoming year. The customs of Yule are in many ways similar to the ones of Christmas. This is because Christians stole the pagan customs to create their own holidays. Customs such as gift giving, family gatherings, decorating trees, dancing around the tree, hanging up mistletoe, burning logs, yule goat decorations, yule boar and carol singing all stem from the Pagan Yule. These customs vary however. Denmark (Jul), Finland (Joulu), Estonia (Joul), Iceland (Jol) all have few of the customs listed here. You can find a satanic ritual in the article Satanic Yule Celebration. Imbolc (also known as Imbolg, Candlemas, Oimelc) is a celebration of Brigid, the goddess of poetry, healing and smithcraft. Usually celebrated on February 1 or 2nd in the northern hemisphere, and August 1 or 2nd in the southern hemisphere. Most commonly it is celebrated on February 2, which falls halfway between the Winter Solstice and the Spring Equinox in the northern hemisphere. 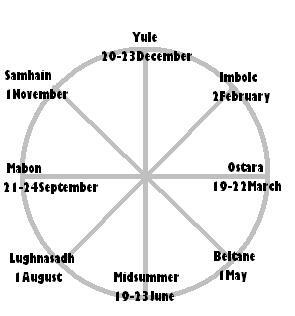 Imbolc is traditionally a time of weather prognostication. Ostara (also known as: Eostre, Eastre, Esther, Easter) is a festival falling on March 21st. Also known as the Spring Equinox, it is a time when day and night are equal. Whalen tells us that in this time rituals for renouncing Jesus are done. Also says that during this time apples are consumed to symbolize the forbidden fruit and celebrate the knowledge Lucifer has given us. Now I shall not talk about the pagan Ostara, but will give information on the Demonolatry celebration which also falls on March 21st. 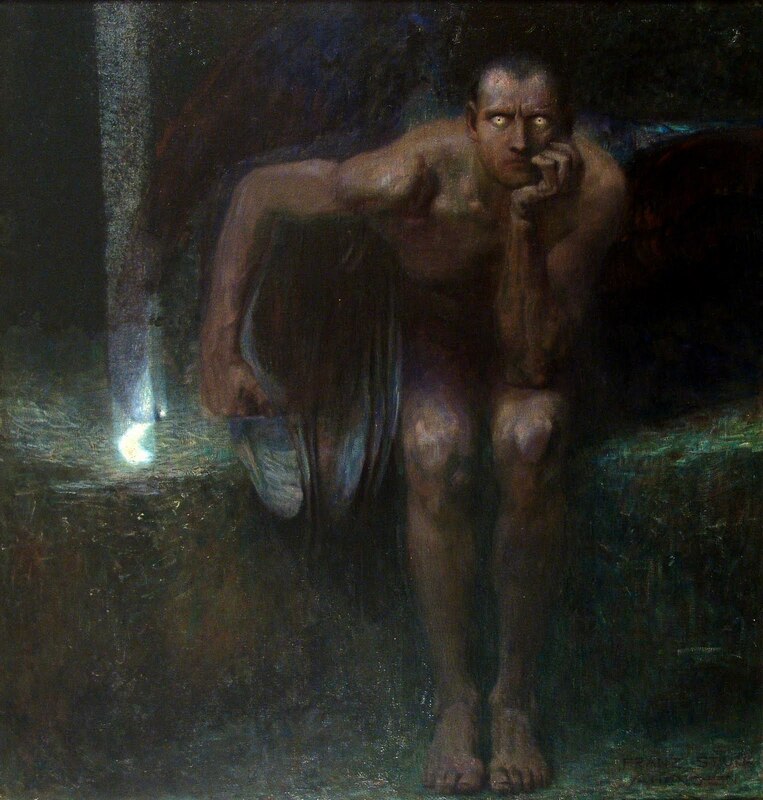 It marks the beginning of Spring and a ritual to Lucifer is to be done, for reason that practitioners decreed that during this period the essence and manifestation of Lucifer is felt stronger in Spring, especially in March. Why it is done? Simple. To celebrate the passing to the new season and to honor Lucifer. During the Spring Equinox marriages are used to be held. Beltane (also known as: Bealtaine, Bhealltain, Walpurgisnacht, Walpurgis Night, Walburga,) is a festival related to Walpurgisnacht and falls on May 1st. It marks the beginning of Summer and is a festival of fire and fertility. Mostly celebrated in Ireland, Scotland and the Isle of Man, now being celebrated by neo-pagans and wiccans from all over the world as an important festival. The belief, like in Samhain, that spirits of the dead are closer to us was also common in old Beltane tradition. The Satanic Bible describes it as the night when legends rumoured demons would come forth in wild revelry. Also as in Samhain, a feast and bonfire is done. Since 1988 a festival called Beltane Fire Festival has been held every year during the night of 30 April on Calton Hill in Edinburgh, Scotland. Walpurgis Night is quite the same thing as Beltane. Two important events that took place on Walpurgis Night is the suicide of Adolf Hitler and in 1966 when Anton LaVey shaved his head and declared the official founding of the Church of Satan. Since I did not celebrate Beltane, I shall not give a ritual for it here. Midsummer (or Litha to neopagans) is a celebration of the summer solstice, marking the middle of summer and takes place on 21st of June. Although originally pagan, it is also associated with the nativity of John the Baptist which falls on June 24th. Bonfires, feasting, singing and dancing are ways to celebrate Midsummer around the world. However, much of Midsummer’s original celebrations changed, as Christianity turned these celebrations into Christian celebrations (as it did with most Pagan celebrations). In Demonolatry Midsummer is also celebrated on June 22. On this day Demonolators make a ritual to Flereous. Midsummer is being celebrated in Australia, Brazil, Bulgaria, Canada, Croatia, Denmark, Estonia, Finland, France, Germany, Ireland, Italy, Jersey, Latvia, Lithuania, Norway, Poland, Portugal, Romania, Russia, Ukraine, Spain, Sweden, United Kingdom and America. Midsummer fairs are held in many Romanian villages and cities. The oldest and best known midsummer fair in Romania is the Drăgaica fair, held in Buzau between 10 and 24 June every year. Lughnasadh (also known as Lammas) is a celebration marking the beginning of the harvest season, the harvest of grain, the ripening of first fruits and was traditionally a time of community gatherings, market festivals, horse races and reunions with distant family and friends. Mabon or the Autumn Equinox is a time when light and darkness are balanced. It is being held on September 21st or 22nd. According to Whalen, it is a time to reflect upon yourself – years past, and years yet to come. In Demonolatry, the Autumn Equinox is being celebrated with a ritual to Leviathan. It is a celebration of the water element (Leviathan is water elemental). Said to be a good time for divination practice and worship (also for initiation and emotional ties). One other important holiday that I strongly believe it should be celebrated is your own birthday. The day you were born is the most important day of your life, because if it were not for your own birthday you would not be here.